This year’s lambing seems to have been the longest ever. Although the flock was due to lamb in two distinct batches, the two seemed to merge into one, and lambs were born on every day from the beginning of March until the end of April. Overall it’s been a reasonable lambing. We had fewer lambs born than last year, but the wonderful Spring weather has meant that the lambs have thrived, and are generally growing far better than they did in the long cold spring of 2013. Sheep farming is highly seasonal, but it would be nice to have a break between the strain of the lambing season and the next seasonal challenge. 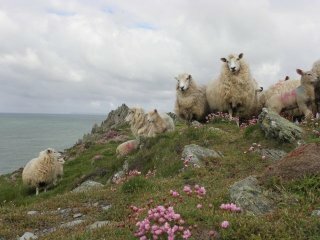 But this year’s warm weather has meant that the Blow flies have been bothering the ewes especially early. In warm weather these flies lay their eggs on the sheep’s wool, the eggs hatch into maggots in 2-3 days. The maggots then start to feed on the sheep’s skin and in no time at all can cause horrendous damage to the sheep. Untreated a ewe with bad ‘fly strike’ can be eaten alive in just a few days. So the lambs need to be sprayed with a chemical that keeps the flies at bay for up to ten weeks. Once the ewes are shorn they will not be bothered by the flies for a month, so this week, a little earlier than usual we’re starting the shearing and spraying the lambs. 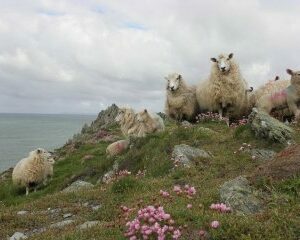 On top of that, the lambs on Morte Point have developed ‘strip’ which is a tiny sore between the toes of the hoof. Although it’s comparatively easy to cure, each lamb has to caught and treated individually. I treat about half a dozen each day as the problem works it’s way through the flock.